The alpha trials included submerging Indiana (SSN-789) for the first time and completing high-speed maneuvers. 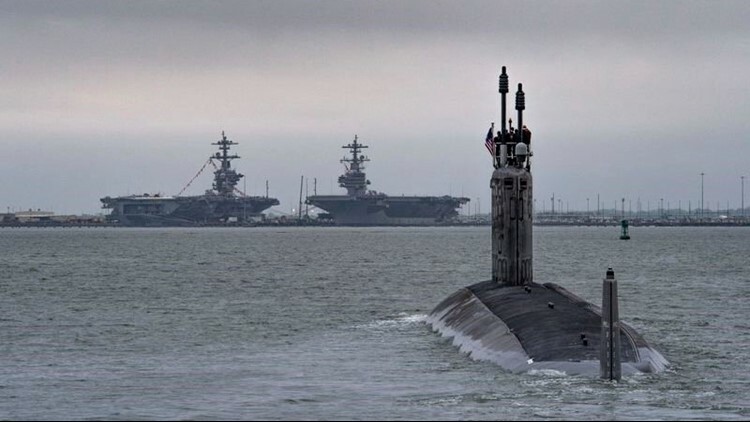 NEWPORT NEWS, Va. (WVEC) -- Huntington Ingalls Industries says it has just completed its initial sea trials for the Navy's newest fast-attack nuclear-powered submarine, Indiana (SSN-789). Known as alpha trials, the shipbuilder tested Indiana's systems and components, which included submerging the sub for the first time and completing high-speed maneuvers. Construction of Indiana began in 2012, and it was christened last year, with Vice President Mike Pence in attendance. After trials are completed, the submarine will be delivered to the Navy. The submarine&nbsp; Indiana &nbsp;departs for its first set of sea trials with two HII-built aircraft carriers visible in the distance at Norfolk Naval Station. It's the third Navy vessel christened with the name Indiana. The two others were battleships, one used during the 1898 Spanish-American War and the other in the Pacific Theater during World War II. Indiana is the 16th Virginia-class submarine to be constructed.